With our Spanish Write right teaching activity for the topic "Colours" you can introduce the written texts in Spanish for Colours. 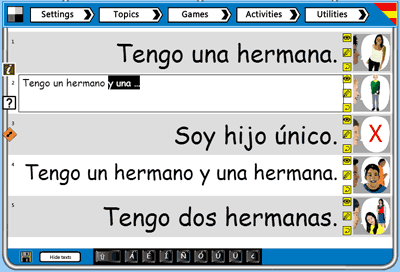 The Spanish is displayed on a large scale and can be hidden, highlighted, edited and saved to custom labels for use in other activities. Write right is an effective activity for introducing or reviewing written language in the Spanish MFL classroom. Texts are displayed in sets of 5, 10 or 20 and can be edited.